Prompt, Courteous Customer Service, Including 24/7 Emergency Service. Sure-Fire has built its reputation on prompt, courteous customer service. Our service fleet is avilable 24-hours a day, via fully stocked, radio and computer dispatched trucks. Your furnace went out at midnight? Your air conditioner quit on a hot Sunday morning? No matter what your problem is or when it occurs, one of our factory-trained service technicians will be at your home or business quickly to solve it. Even if a service repair requires new parts, Sure-Fire won’t keep you waiting. We maintain one of the most complete in-house parts inventories in the state. And with today’s equipment, where parts often aren’t interchangeable among different brands, having the right part may mean the difference between your furnace getting fixed now or next week. Sure-Fire carries parts for most major equipment manufacturers. In fact, we spend more time servicing our competitors’ equipment than our own. 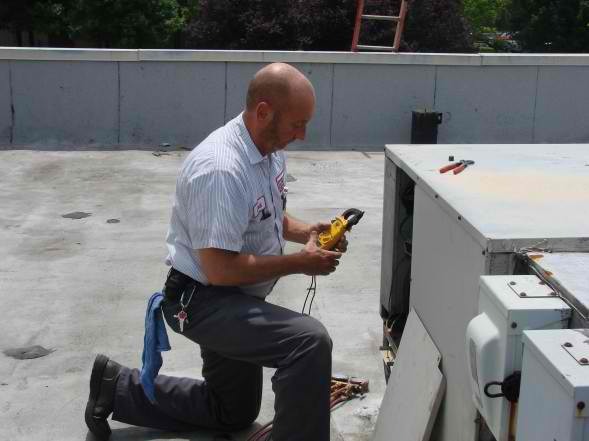 And because studies show that business owners who do not regularly maintain their HVAC equipment pay an average of $300 more per year on service calls and energy costs, Sure-Fire offers several service plan options.